The American Airlines AAdvantage program has had its ups and downs — most recently, its massive devaluation in March — but there’s still a lot to appreciate about the program. The carrier is now celebrating the 35 anniversary of AAdvantage by giving away 350,000 AAdvantage miles to 35 grand prize winners. Although your odds of winning the grand prize aren’t that high, you can still make out, as you’ll get 350 AAdvantage miles just for entering. American Airlines is celebrating the 35th anniversary of its AAdvantage program. To register, visit AA’s website, where you’ll enter all the basic info and what milestone you’re celebrating. 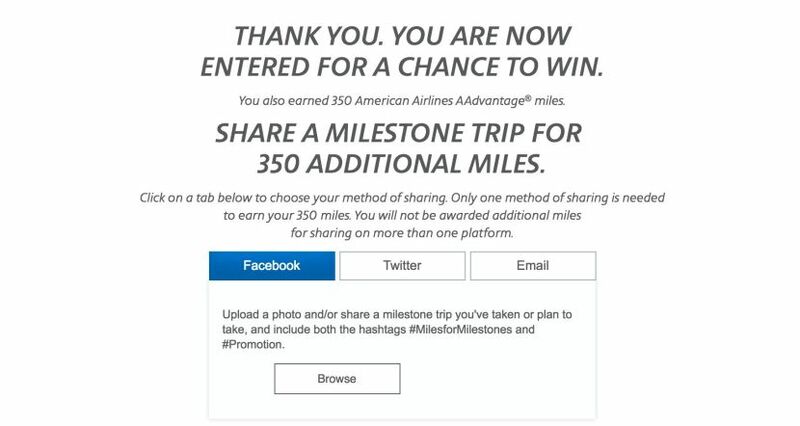 You’ll automatically receive 350 AAdvantage miles, but you can also get 350 additional miles by sharing your milestone on Facebook, Twitter or through email. The promotion is active through 1:00pm EST (12:00pm CDT) on June 1, 2016, so act fast. The miles you get will post to your AAdvantage account within 6-8 weeks after the promotion ends. While these easy 700 AAdvantage miles won’t exactly get you a free flight, there’s really no reason not to sign up.